You know what we love most about beads? Their versatility. They can be used to bling out your sunnies, create an awesome woven bead necklace or even make a spectacular chandelier. Crazy, right?! We’ve explored almost every avenue related to these beauties except for one — beaded clothing. Take a look at 27 of our favorite bright, fun and textured pieces of bead-embellished clothing! 1. Mango Aztec Appliqué Dress ($70): The bright beaded sleeves add a dramatic point of interest to this sleek dress. We love how much the colors stand out against the blank canvas. 2. ASOS Premium Vest with Folk Beading ($118): While this strangely shaped vest may be a little folkish for many of us, the intricate beading makes it worth adding to our list. 3. Forever 21 Glam Beaded Shorts ($43): These glam shorts are perfect for a night on the town with your gals. Look how easily they can be dressed up! 4. Aryn K Blazer ($61): We love the sparkly feminine touch to the sleeves. 5. Free People Beaded Bolero ($30): Remember the shrug fad of the early 2000s? We think it may be time to bring it back. 6. Zara Beaded Dress ($70): Our favorite thing about this? The randomness of the design. Who knew that beaded ducks, stars and arrows could coexist so beautifully on one dress? 8. Nasty Gal Bomber Jacket ($78): Start the night off right with this bomber jacket. 9. ASOS Check Pencil Skirt ($73): We sure love our Scot-inspired fabrics. 10. Free People Decorated Rebel Top ($50): How cool are those lattice beaded shoulders?! We wish we could add that embellishment to more of our clothes. 11. Mod Cloth Hamptons Holiday Dress ($52): Yes, it’s called a holiday dress. But that doesn’t mean you can’t rock it any time of the year! 12. Boden Chelsea Sweater ($42): We’re so glad that sweatshirts are now accepted by the fashion world. It makes our lives so, so much easier. 13. Zara T-Shirt With Beaded Neckline ($30): This simple tee has a really rad neckline. It’d go well with a printed skirt or shorts. 14. Daily Look Beaded + Sequined Dress ($100): It’s the opposite of a mullet — business in the back, party in the front. 15. Windsor Beaded Back Peplum Top ($25): The peplum adds a flirty touch to the top, as does that beaded back. Va-va-voom! 16. Zara Beaded T-Shirt ($30): This t-shirt is simple, but super dazzling. We think it’s great DIY inspiration as well. 17. Nasty Gal Jacket ($188): Yes, we’re taking a chance with this one. Yay or nay, ladies? 18. ASOS Embellished Playsuit ($48): Super delicate and super dressy. We feel like this romper would fit in anywhere. 19. Zara Beaded Top ($40): Yes, yes, yes! We absolutely love this embellished crop top. 20. Buckle Twisted Tank Top ($34): The twistiness (it’s a word now) of this top is super unique. We also appreciate the sea foam and gold color combination. 21. River Island High Waisted Shorts ($80): Lemon yellow is one of our favorite colors for clothing. Everything automatically becomes a bold statement! 22. Zara Dress with Beaded Shoulder ($60): This is definitely our favorite piece out of them all. That ethnic beadwork is just gorgeous. 23. ASOS Jacket ($57): Looking for a lighter, glitzy jacket? Looks like you found it. 24. French Connection Fauna Fantasy Dress ($198): This entire dress is beaded. Crazy, right? 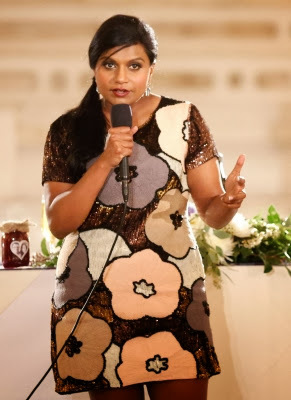 We could totally see Mindy Kaling’s fashionista character rockin’ this one on The Mindy Project (oh wait, she already did). 25. Ecote Desert Halter Top ($69): If you’re gearing up for festival season, we think you should add this top to your list. 26. Topshop Beaded Back Maxi ($90): This shade of jade is stunning. The dress is so simple, yet perfect. 27. ShopAkira Beaded Shoulder Top ($30): Last but not least, another top with beaded shoulders. Sorry, we couldn’t resist. What do you think about bead-embellished clothes? Which piece is your favorite? Let us know down below!